Sbardella Slate, Inc. has the ability to custom fabricate sheet metal to enhance the beauty of your fine slate roof. 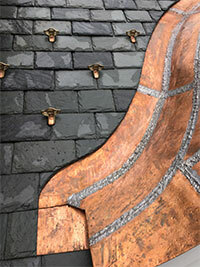 Copper turrets, valleys, flashing, flat seam or standing seam, ridges, mouldings, etc. You name it... we do it all! You have chosen the best when you decided to have a slate roof installed. Now, don't skimp on the details. Properly installed flashings, valleys, flat roof sections, etc. are extremely important in protecting your home from the elements. 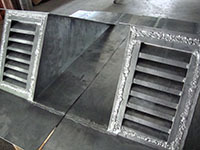 These photos are a few examples of our custom sheet metal work. 1. Custom designed, lead coated copper, crown facia moulding, vented soffit and crown soffit wall transition moulding. 3. Standing seam copper on round dormer. 4. 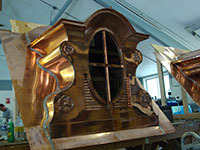 Custom copper window faces. 6. Standing seam, lead coated copper. Well house roof. 7. Through to the flue, lead coated, copper flashing. 8. Through to the flue copper flashing. 9. 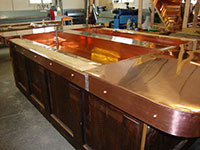 Custom, flat seamed, soldered, copper window pan. 10. Flat seamed, soldered copper. 11. Custom copper gutter on turret. 12. Custom, lead coated copper dormers and turret. 13. Custom copper ridge cap. 14. Flat seamed, soldered copper eyebrow dormer. 15. Flat seamed, soldered copper and built in gutter on turret. 16. Flat seamed, soldered, lead coated copper. 17. Custom copper chimney cap. 18. Prepatinaed, custom copper, standing seam, bell tower roof. 20. 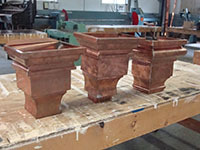 Custom copper chimney caps. 21. 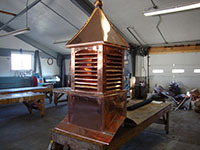 Custom copper clad cupola. 22. 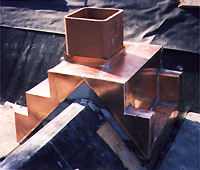 Lead coated copper vents. 23. 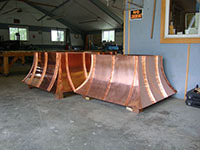 Custom copper salad bar. 25. Custom copper ridge cap. 26. Flat seamed soldered eyebrow dormer and bronze snow guards.